Saturday morning, in a word: Ouch. 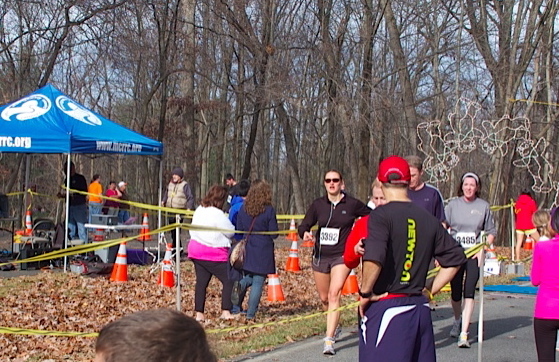 “Ouch,” because of the ever-present rolling hills on the Montgomery County Road Runners Turkey Burnoff course. “Ouch,” because being able to balance on a stability ball on your knees while holding a medicine ball (which I can do, thanks to my pre-skiing workouts) means absolutely nothing in a road race if you’ve barely been running. “Ouch,” because I’m still trying to shake a seemingly never-ending head-cold, which left me wheezing at the end of most of the aforementioned hills. “Ouch,” because all those ouchies over a little five-miler made me very, very scared about what this weekend’s Hot Chocolate 15K will hold. The race started at 10 a.m., which left me plenty of time to consume my pre-race oatmeal and coffee without needing to set my alarm. I got to run with Katie, until her legs remembered they just trained for a half-marathon, and until my legs remembered they hadn’t trained for anything. I got to run through Seneca Creek State Park, which was lovely and peaceful, despite those stupid little hills. And the post-run spread was amazing for a low-key, low-cost ($10 for non-MCRRC members!) race, with cupcakes, trail mix and cinnamon buns in addition to the standard bananas and bagels. Also, even as this race shook my confidence in my ability to run a painless 15K this weekend, it also kind of affirmed my confidence in my ability to at least finish a 15K on very little focused training. See, I’d meant to run steady 10-minute miles on Saturday. But I left my Garmin at home, and with mile markers that seemed woefully off (I’m pretty I didn’t jog that first mile in eight minutes), I had a hard time judging my pace, which was actually closer to 9 minutes and change—my official race time was 46:30, and my watch time was 46:10. It wasn’t easy, but it was more than I thought I had in me on that particular morning. This means that if I wear my Garmin to the 15K, and be reeeally careful to run no faster than 10-minute miles for the first 10K (what, like I’m going to PR that last 5K or something? ), I should at least be able to reach the finish line/the holy land of chocolate rivers, where dessert is served long before it’s appropriate to eat lunch. I’m not saying I’ll feel or look good doing it, but I’ll get there. I feel tired just *looking* at myself in this picture. I think I'm working on stopping my watch. The first thing that pops into my mind upon seeing this picture is: Is this woman having a heart attack? Heeey, look! It's my friends! And they have a camera! I was going for "victorious" here. I was also feeling nauseous, which comes across more clearly. Feeling better enough to rate the hills with Katie. 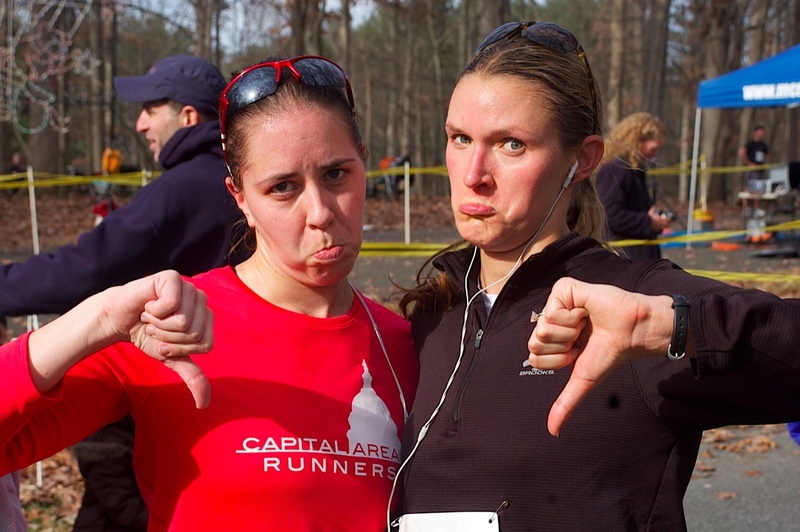 We rate the hills a big, fat thumbs-down. 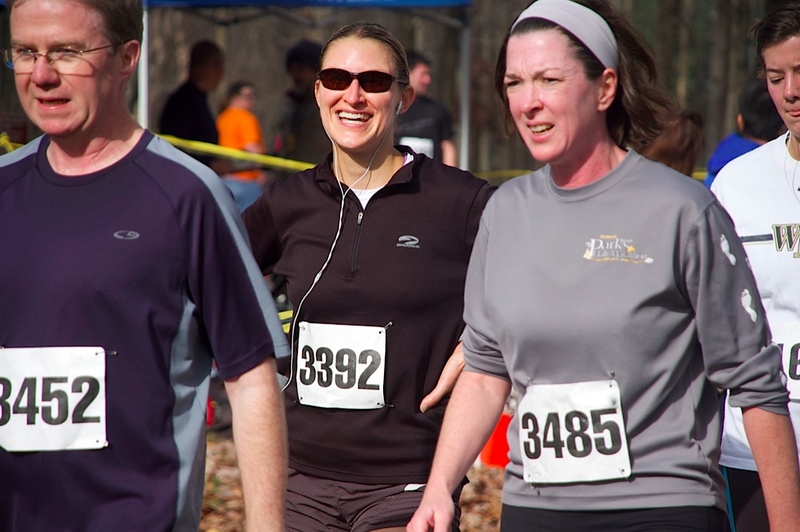 Moments later, we are still cursing the hills, but talking about doing the 10-mile race next year. Great job Amy. It is amazing how quickly the conditioning for running goes away, isn’t it. but I am terribly impressed with the balancing on the swiss ball with a medicine ball. Very cool. The hills from this race will help with the Hot Chocolate 15k. It is NOT a flat course, some of it overlaps with the end of the course Wilson Bridge Half, and it was not flat for more than a few hundred yards at a time once we were running at the National Harbor. I bet this was a pretty race. Montgomery County has some awesome parks and trails. I have left my Garmin at home several times lately (sometimes on purpose…and sometimes not) and find I actually run faster. Hmmm. Good luck in the 15K! Yeah, this pretty much sucked. 10M next year? 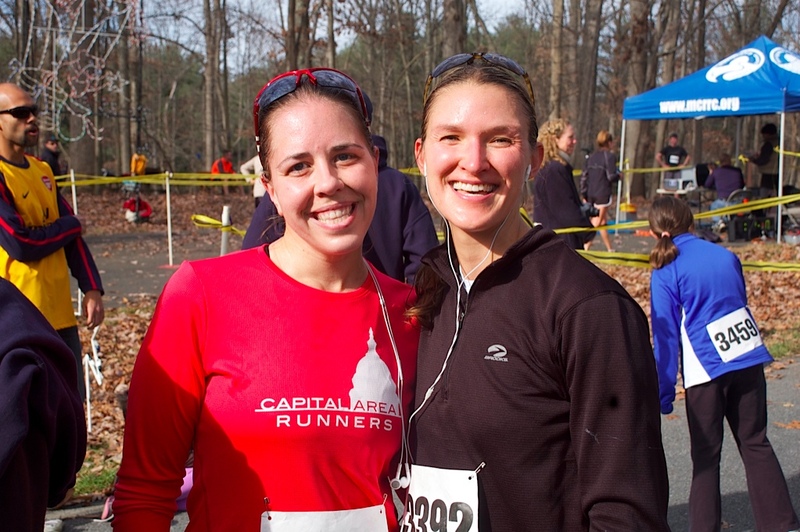 Thanks for running with me (on and off) – this was a tough one! 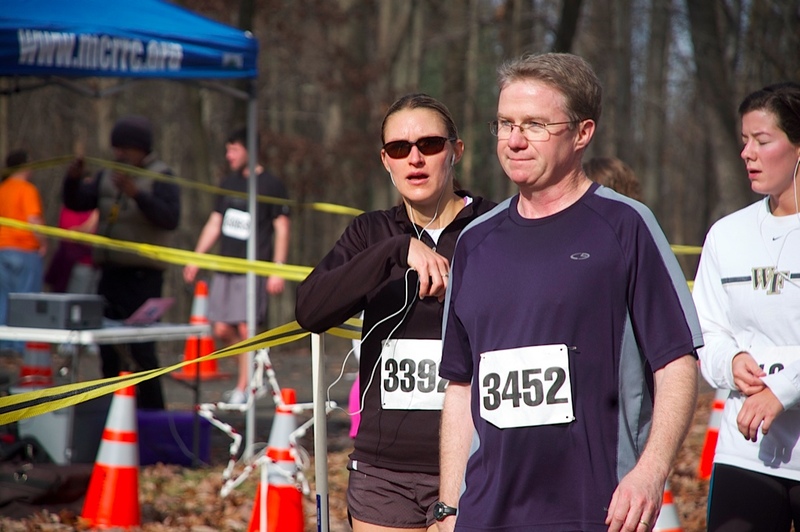 And come to think of it, that 5K we did in the spring was hilly as well. No more picking races for you. Anyone can run 5 miles, I say. This swiss ball – medicine ball business is a real talent. Those hills looked pretty serious. If you were running 9ish min/miles on that, you’re gonna be just fine at the 15k! Oh, and the two of you pouting is ADORABLE. Ugh. Hills. At least you will be ready for next weekend’s course. 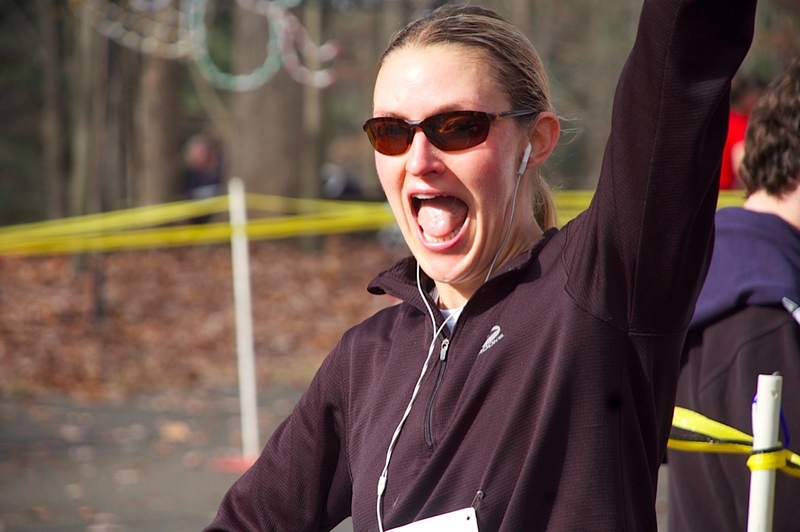 And I imagine that chocolate will be enough motivation to get you through 15k!